Firmware Update for Personal Audio System "SRS-X77"
Do I need to download it? This update utility is not necessary if your personal audio system has already been updated to firmware version 1.60.XXXX. We recommend this method as it's the simplest way to update. It usually takes about 3-10 minutes. 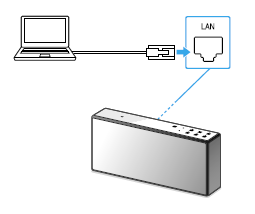 Note: When the speaker is connected to a PC directly using the LAN cable for the version checking, remove the LAN cable, and reconnect it to an Access Point. Wait until the LINK indicator stops flashing and stays lit in orange or pink. Whenever a software update becomes available, the UPDATE button lights up. The software update failed. After this happens, you cannot perform any operation or use any function on the set except the power button. 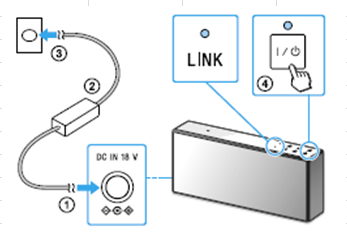 Please check the condition of the speaker by following these steps, and complete the software update using a USB flash drive. Tap and hold the button to turn the speaker OFF. Tap the button to turn the speaker ON. Wait about 3 minutes (or until the network connection completes), then check the UPDATE button status on the speaker. We recommend you use the Internet to update if you can. If not, you can use this method instead. You'll download the update to your computer, transfer it to a USB memory device, then transfer it to your SRS-X77. Note: If you are using Windows® 8.1, please use it in desktop mode. Operation is not guaranteed for all PCs installed with a compatible OS. Note:It is impossible to be back to the previous software version after software update. Download the firmware update. The file SRSX77V1602994.zip 154 MB (161,896,517 bytes) will begin downloading. Note: Depending on your operating system, the file may be automatically unzipped when it is downloaded. You may also not be able to unzip the file using the procedures described above, depending on the operating system that you are using. In the latter case, please use a decompression tool. The UPDATE button lights up after beeps are heard. Note:If you are connected to the network, you might already see the UPDATE button lit in orange. Even in this case, please carry out the procedure as described on this page and check the beeping sound. While the UPDATE button is lit, insert the USB flash drive to the DC-OUT ONLY (USB) port slot on the rear side of the speaker. If the indicator flashes in red and the update button in orange then the software update has failed. You will need to download the firmware update to your computer, save it to a USB flash drive and then upload it to your speaker. Follow the steps outlined below to do this:Note:It is impossible to be back to the previous software version after software update. A folder named Update will appear on your desktop containing the following files: LUTE03-FW.BIN; LUTE03-FW.ID; LUTE03-FW_MB.BIN; LUTE03-FW_MB. Note: The downloaded file can automatically unzip when using the operating systems above, but if you’re not able to unzip the files using these steps then you may need to use separate decompression software. Switch off the speaker once the indicator flashes red and the update button flashes orange. Note: Please carry out steps 3 to 5 within 3 minutes. The firmware update will begin downloading to your speaker once the update button starts to flash. Note: The speaker cannot be used during the download. The speaker will automatically switch to either standby mode or Bluetooth/network standby mode when the download is complete. Check that the update is complete with the Software Version Check for Wireless Speaker SRS-X77. How to check your firmware version. Then, the update is completed.